Using BioJOINT in combination with BioFATS provides a powerful synergistic support to your pet’s immune system, regulation of inflammatory response as well as joint and connective tissue support. Antioxidants protect against free radical-induced tissue damage, support connective tissue health, help combat toxins and pollutants. Did you know? A pet that is spayed/neutered too young can develop hormonal deficiencies that cause abnormal bone and joint development. 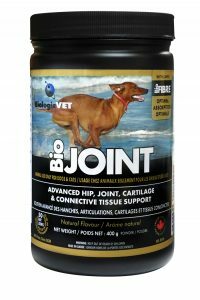 BioJOINT’s ingredients have strong anti-inflammatory properties, and play a role in the creation of cartilage and connective tissue. NON-MEDICINAL INGREDIENTS: Organic defatted sunflower and sesame seed, silicon dioxide. CAUTIONS: *Not for long term use unless directed by a veterinarian. Do not use in 1) pregnant or lactating animals 2) animals with bleeding disorders, gastrointestinal ulceration, kidney or liver disease. What does “For long term use consult a veterinarian” formerly stated on label “not for long-term use” mean? This purposely vague description is neither clearly defined nor is it a fixed duration of time. It may include a time frame of several days, weeks, months or even years. Health Canada requires the use of this statement on our labels as part of the Notification Program for Veterinary Health Products (VHP). This statement is summoned when certain ingredients are present in a product, such as enzymes or various herbal extracts. In BioJOINT it is the enzyme Bromelain from pineapple fruit that requires this revised statement. Dietary supplements, such as BiologicVET’s, are quite safe to take every day. However, it is best to keep in mind that the long-term use of any supplement should be discussed with your trusted veterinarian. They will help evaluate and assess the pros and cons of supplementation based on your animal companion’s unique and individual needs. The mandate of Health Canada’s Veterinary Drugs Directorate (VDD) is to protect human and animal health and the safety of Canada’s food supply. In support of this objective, the VDD sets standards and promotes the safe use of veterinary drugs (including VHPs) administered to animals in Canada. There is a need to ensure that VHPs are regulated in a flexible and risk appropriate way, in order to minimize the burden on industry and facilitate access to products that may provide additional tools for maintaining health and welfare for animals. For example, many low risk products are used as additional health management tools and may reduce the need to use conventional drugs, including antimicrobials. Given the safeguards of the Program, including pre- and post-market oversight of VHPs imported and sold in Canada, Health Canada considers it unlikely that a product satisfying all applicable requirements could present a risk to the safety of animals or humans, including food safety. Health Canada takes a risk-based approach when a regulatory non-compliance is identified. The Program is in effect as of November 13, 2017. The delivery system of BioJOINT is a certified organic blend of defatted flax, sunflower and sesame seed providing the good bacteria in the intestinal tract of the dog or cat a valuble prebiotic food source to improve their immune system. This fibre also supplies plant estrogens called lignans that the good bacteria convert into mammalian estrogens balancing hormone function in the dog and cat especially when they have been spayed or neutered. Each scoop (1 tbsp) will provide at minimum 19 mg of lignans, enough for the Vet recommended amount of 1 mg of lignan per lb of pet weight. By improving the intestinal tract function, immune system, and hormonal function of the dog or cat there is better absorption of the nutrients from the formula as well as from the food they are eating allowing the BioJOINT formula to begin to work in a very short time. Hugo began suffering from back spasms during the summer of 2012. After being diagnosed with Stage 2 disc disease I wanted to find something that would control the spasms, help repair the damage that the spasms were causing and make it possible for Hugo to run and play without suffering the consequences the next day. He started BioJOINT in November of 2012 along with the BioFATS. That winter, Hugo only had one spasm! Not only that, the FATS formula helped his skin and coat as his skin allergies diminished drastically! At his last vet check up we were told that Hugo was one of the most muscular Yorkies the vet had ever seen in 28 years of practice! His form and structure was amazing. The vet was beyond impressed. Hugo is going to 7 years old in April and is still able to run and jump like a puppy without hurting his back and we owe it all to BioJOINT. Thank you BiologicVET, from the bottom of our hearts!